I know what you’re thinking, and no this isn’t a weapon wielded by armed guards from Jabba’s palace in Return of the Jedi. Yea, I’m sure. It’s actually a new keytar from Roland. For those that need it spelled out to them, that’s a keyboard shaped like a guitar. Roland has been making keytars since Vader tossed the Emperor to his doom, but let’s just say they’ve never really taken off. Roland’s big claim for their new AX-Edge Keytar is that it will help keyboarders stand out on stage, and I don’t think anyone would doubt that. It’s not from Star Wars, it’s from Roland. The new AX-Edge Keytar is a weapon for synth players who want to get a lot more involved on stage. The AX-Edge’s sleek design is complimented by interchangeable ‘Edge Blades’ so you can truly customise your weapon. 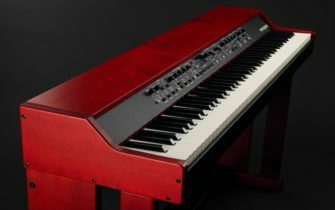 With 49 velocity-sensitive, aftertouch-compatible, full-sized keys, players can also express themselves through the music. The unit comes decked out with a modulation bar, portamento, octave switch, and a pressure-sensitive pitch ribbon. Roland’s new synth also comes standard with all of Roland’s latest lead, bass and keyboard tones, as well as on board effects. All sounds and parameters can be edited via Bluetooth and the AX-edge editor app. With four hours of battery life you’ll be sure to make it ’til the end of the saga. For more information take a look at Roland’s website.